Hubby and I enjoy charcuterie and cheese boards on the regular…maybe a couple times a month for sure. Typically we enjoy on Friday night with a big hunk of crusty bread and some vino. Charcuterie boards are super easy to whip up, they always look nice and taste delish! If you want to know how to assemble your own charcuterie board, check out this post. In the past we’ve often bought these little teeny tiny marinated feta cheese packs that are honestly not much bigger than the small dish of oil you see in this recipe. And those are not cheap, you guys. You get a few pieces of feta cheese, a bit of oil and that’s it. So, marinated feta? Yep, I’m making it myself to go with our charcuterie board, thank you very much Mr. grocery store guy. Mix everything up into a jar and let the ingredients get to know each other overnight. And, if there’s an ingredient you don’t prefer, feel free to leave out! 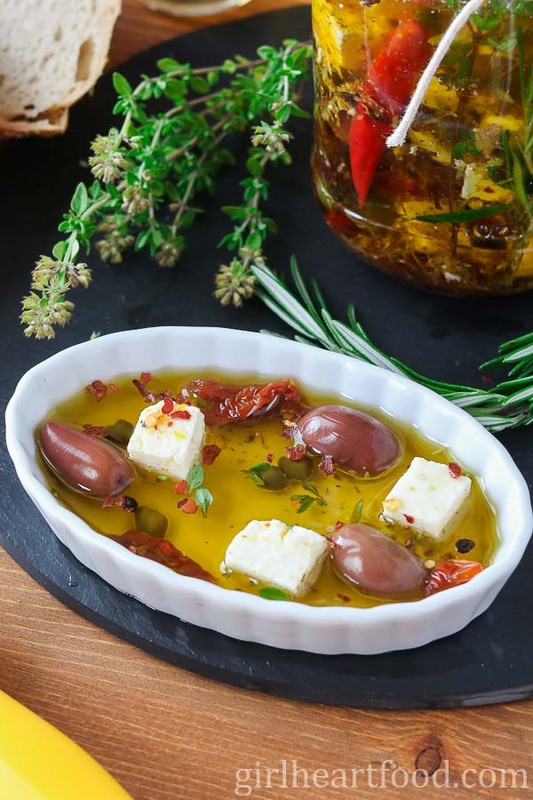 What type of Oil Do I Use for Marinated Feta Cheese? 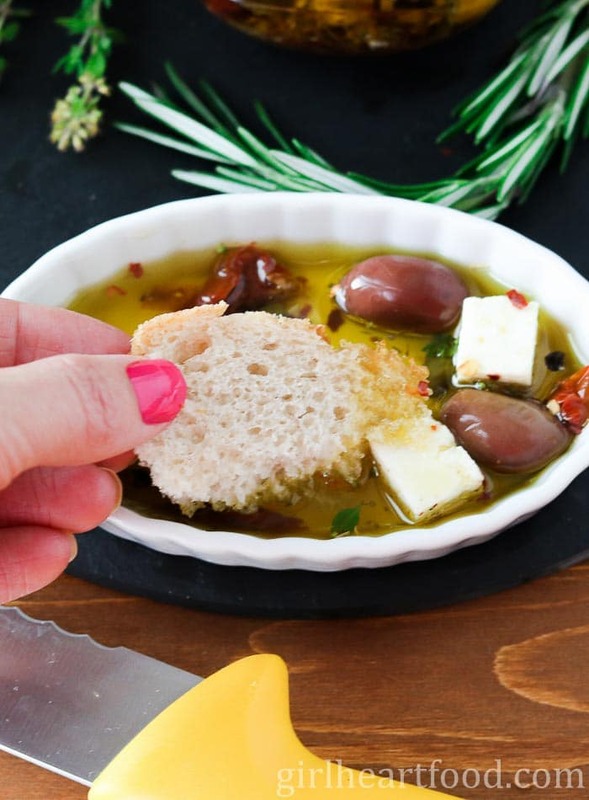 Since olive oil is such a prominent component in this marinated feta recipe, I highly recommend using a quality one, like Olio D’Oliva Extra Virgin Olive Oil from Pomora. This is not the time to cheap out with olive oil. You want the good stuff 😉 Wait, isn’t that always, lol. If you can recall, I shared a recipe using Pomora a while back. They have a neat little subscription whereas you can adopt a tree from one of two award-winning growers. You’ll even get updates on how your tree is doing. Plus, every quarter you will receive a shipment of three-250 ml oils. This quarter I received a shipment of their extra virgin olive oil and it was the delicious base to this herb marinated feta. Great as part of a tapas menu for a multi-course meal. Check out this round up for some delicious tapas recipes. Make and give as a hostess gift. Looking for more homemade food gifts? This is a great collection! Use a good quality olive oil! The oil is such an important component of this recipe. Cut your feta into bite-sized cubes so it’s not only easy to eat, but you get maximum flavour absorption from the oil and herbs. Keep this marinated feta refrigerated. When about to enjoy, remove from fridge for about 10-15 minutes before digging it. Olive oil tends to firm up a little in the fridge. Ensure that you use a large enough jar for all the ingredients to fit in there and that everything is submerged. If you need to top up with a tad more oil to cover everything, that’s a-ok! Don’t have the dried herbs listed? No worries! Use what you have on hand. Have just rosemary and oregano, but no thyme? Use those. Also, if you just have herbes de provence (a French mixture of herbs) that works wonderfully. I love dunkin’ a nice bread into the oil and enjoying with a glass of wine. Oh, the simple things. Hope you enjoy this herb marinated feta recipe as much as hubby and I do! 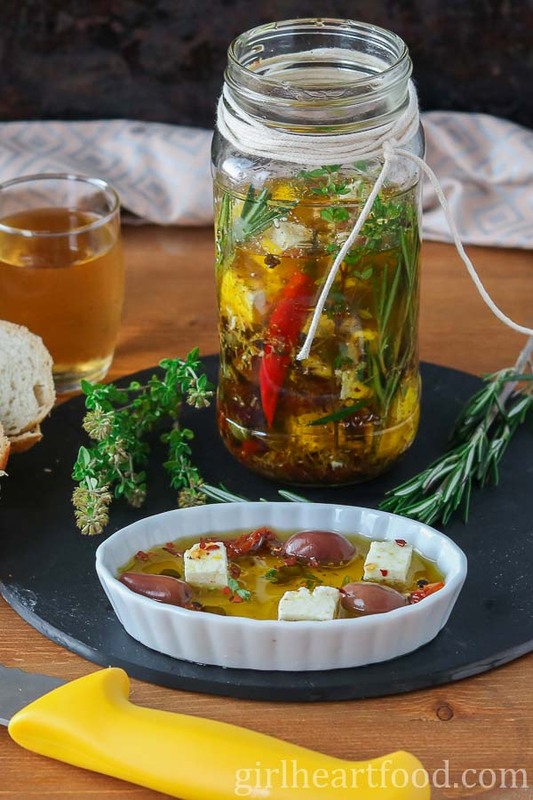 This easy Marinated Feta recipe combines a little heat, some fresh herbs and savoury flavour from feta cheese, black olives and sun-dried tomatoes. Perfect for dunking bread, as part of a multi-course meal for entertaining or as a foodie gift for someone special! Place oil in a clean, large mason jar and add chili flakes, chili peppers, black peppercorn, oregano, and thyme. Stir. Add feta cheese, ensuring it is completely submerged in the oil. Note: if you need to add a little more oil to submerge cheese, that's ok.
To oil mixture add remaining ingredients. Cover and gently shake a little. Refrigerate for 24 hours. Upon enjoying, remove from fridge for about 10-15 minutes. It will harden in the fridge, but will liquify when removed. Enjoy with bread or crackers, or use oil in a vinaigrette, over pizza and more. Note: If there are leftovers, keep stored in the fridge and enjoy within a few days. Cut your feta into bite-sized cubes so it's not only easy to eat, but you get maximum flavour absorption from the oil and herbs. Ensure that you use a large enough jar for all the ingredients to fit in there and that everything is submerged. If you need to top up with a tad more oil to cover everything, that's a-ok! Don't have the dried herbs listed? No worries! Use what you have on hand. Have just rosemary and oregano, but no thyme? Use those. Also, if you just have herbes de provence (a French mixture of herbs) that works wonderfully. With all the parties just around the corner, this would definitely make wonderful hostess gifts. How have I not made marinated feta before!? Keith and I would devour it!! So excited to try this, Dawn. Perfect for the holidays ahead! Love this for a dinner appetizer and easy to whip together! Great with a fresh baked crunchy bread, YUM! I love marinated cheese of any sort! Feta is perfect for it, as it stands up so well in the oil, too. A great holiday appetizer! Dawn, this looks so ugh better than the marinated feta I see in stores! A Charcuterie board is something we usually enjoy to enjoy for New Year’s Eve- but looking at this and reading about how you and your hubs enjoy one every couple of weeks or so is making me reconsider – a Charcuterie board with this marinated feta would be perfect for movie night! And I remember you mentioning Pomora in another post- I’m hoping I get my hands on some by NY so I can make an extra special batch of this marinated feta then! To me feta occupies a special status among cheeses:) The combination with olive oil, especially a good one like you have here is an absolute delight. So many ways to flavor the marinade, you are right! Love the idea of gifting little jars of it:) Pinned! Thank you Milena! I really enjoy feta too 🙂 Have a great weekend! Feta is my favorite! I’m totally making this for myself, but I’m going to make a few batches to give out with my Christmas cookie trays too–I always like to add a little something savory with all the sweet. This is BRILLIANT, Dawn! Have a great weekend! I’m definitely trying this one Dawn! We also love a good charcuterie board on the weekends, but they can get kind of pricey. Making our own marinated feta will help cut the cost for sure! And this will make a lovely appetizer for the upcoming holidays! Happy almost weekend! Yay! So happy to hear that 🙂 Thanks Leanne – you too! I love appetizers like this Dawn. So full of flavor! And not hard at all to put together. Perfect for our weekend entertaining. Pinned! Thank you Mary Ann 🙂 Me too! Have a great weekend!